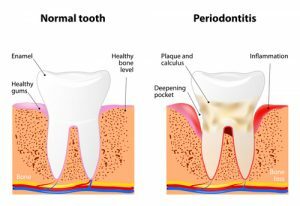 Periodontal (Gum) Disease is an inflammatory disease, which attacks the gums and can progress to attack the bone and other supporting structures around the teeth. In its early stages it is called gingivitis and is known as advanced periodontitis at its worst. It is the single most common cause of tooth loss in adults. There are several symptoms of periodontal disease, however, it is often silent. Many symptoms may not appear until the disease is in its advanced stages. Some common symptoms include swollen, red or bleeding gums, persistent bad breath, gums that recede away from the teeth, or loose teeth. If you suspect you have periodontal disease we encourage you schedule an appointment with us as soon as possible.